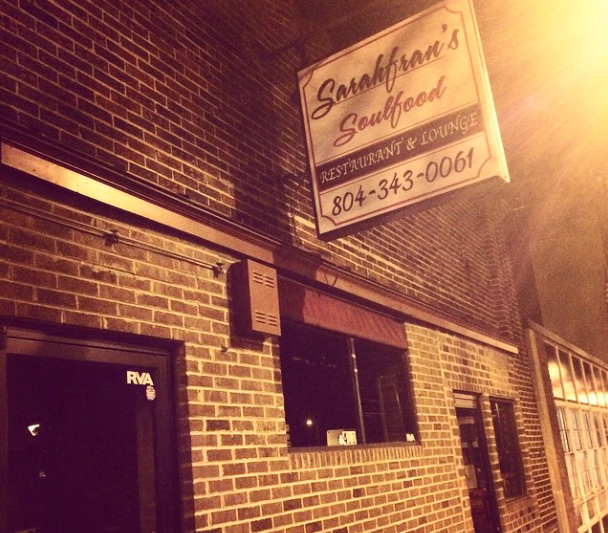 Sarahfran’s Soulfood on 25th Street is apparently closed. Instead of the advertised Sunday karaoke night, the place is dark, and a call to the number listed on the sign returns that the phone is disconnected. The soulfood restaurant opened in May 2013, and later got a glowing review in Style Weekly. A revamp earlier this year was supposed to pair chef E.D.Cox and Deandre Johnson (of OMG Cafe, Johnson’s Southern Comfort), until the 32-year-old Johnson’s shocking heart attack. The location was previously home to OMG Cafe, 25th Street Bar and Grill, Y’alls Grill, and Malone’s Place. We made the mistake of going in there to try it the very week of the Style review. Bad idea. They were so overwhelmed I later understood, but the service was about as bad as I’ve ever experienced and I never ginned up the notion to try it again even though the food was alright. Agree that the building design is a hindrance, but there are other more easily controlled factors I think. Sorry for them in any case. IMO, Mark is correct. No restaurant will ever survive there unless the front is made to look more inviting. They should loose the tinted glass, and install much bigger windows so you can actually see inside…. The zero for four attempts at this location should give rise and warning to future attempts …. suggestions above are all spot-on and utlized for next enterprise or opportuntiy. Another One Bites the Dust. It is almost as bad as those places at 18th and Main with a revolving door of tenants. Windows- that is the bottom line about this location and always has been even after numerous threads with people saying elsewise. When it opened up in 1936 as the Hollywood Cafe connected with the East End Theater it had a full front glass window which can be seen outlined by the different colored brick fill. It needs to go back to that. The facade as is – a person will drive right by and never notice the uninviting very generically bland building that does not say what it is except for a sign high above the door. And the prison bars is another minus. It either looks like a shady place or a storage room rather than a restaurant from outside. Put the large glass window back in and see the difference. I know this is a different era with driveby’s and vandals abound but at least give it a try. All normal restaurants have them or smaller half versions to be able to at least see inside. I have to agree with those who say it may be in part to the appearance of the building. It is hard to tell if they are open and I would think anyone driving by may not even be sure it is operating. I would love to see something succeed there – but I think some construction is in order.